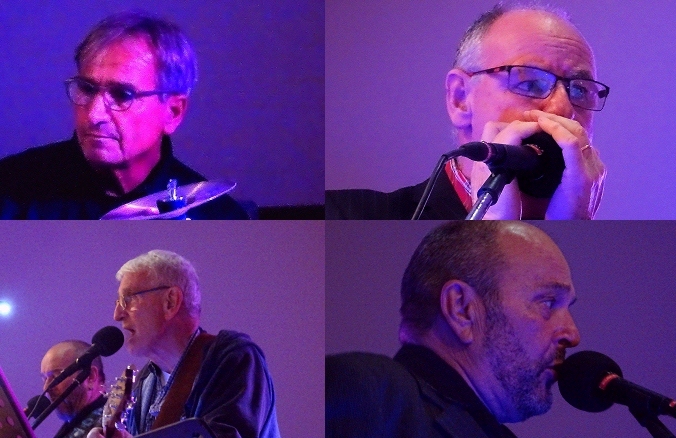 The Brouillac Blues Band was formed in 2008 in SW France with two guitar players who shared an interest in music. Later being joined by Ebbo the drummer and Dennis the bass man - Now available for gigs Folk and Rock with own PA and lighting system and sound engineer. The band was formed some years back with George and Mick playing mainly acoustic blues and folk. George has the amazing skill to play claw hammer ... something that’s very rare today! And difficult! We were joined by the drummer after a gig where he thought it would be an advantage to the band. He was right as Ebbo is good! Then again at another gig Dennis offered his services as the bass man. He has a background of playing all over the north of the UK for many years. So was the birth of four retired musicians coming out of retirement! We play blues, folk, rock and some Reggie too! We are lucky to have a sound engineer who comes for free and we have a full stage PA and lighting. We love to play for charity all around the Dordogne and give something back to the country that has become our host. We have been into schools talking about the origin of the blues, played fetes and small parties. We are retired so costs are low by comparison to many bands. We just love to play. We can put on a major event right down to an acoustic evening so there is something for everyone. We play Irish music. George used to play with a well know Irish band, he still has it! George speaks fluent French, Ebbo Dutch, and me English! So do not be shy if you would like us to brighten up your gig – give us a call.